I don’t think I’ve ever written a character who doesn’t like pizza. 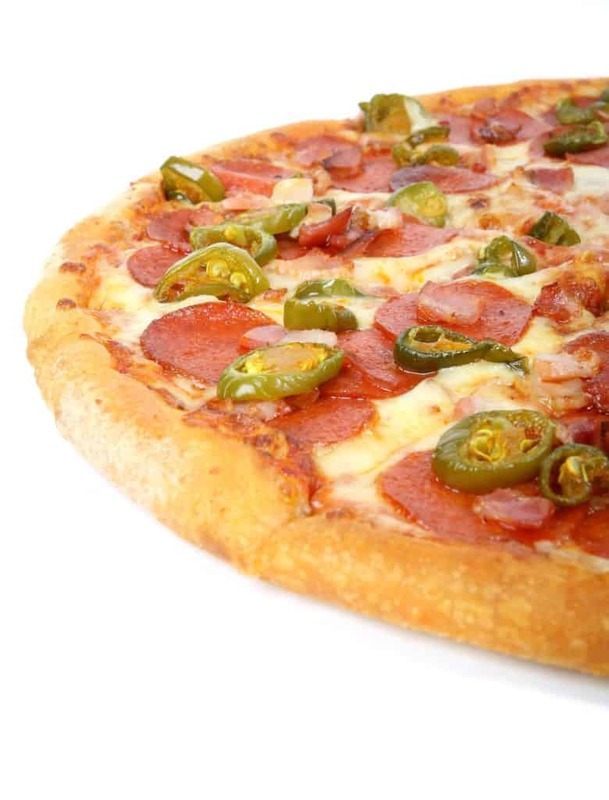 They all have their favourite ideas about what constitutes pizza heaven, of course, and if you put them all in a room together there’d be the usual arguments over thin crust vs. deep dish, chicken vs. Pepperoni, whether tomato sauce is essential, and whether chillies or artichokes are permissible or not. If questioned straightly, she might admit that her dislike and avoidance of pizza has more to do with its waistline-expanding properties rather than the taste. Its understandable that this would be a concern for her, since Cynthia Gilchrist is a SERIOUS chocoholic. The kind that needs a twelve-step program, only she doesn’t think there’s a single thing wrong with loving chocolate. To make up for the effects of that all consuming love, she diligently avoids carbs elsewhere. And if you’d ever seen her in killer heels and a skirt that turns heads… you’d realise this method works just the way she planned it to. So Cynthia won’t go near regular pizza, but I imagine that I could persuade her to try this one. Because, like Cynthia, I’m avoiding refined carbs – though I’m not shy to admit my love of a slice of thin crust, stone-baked pepperoni – and on the rare Fridays when my husband is home in time for dinner, I love to start the weekend with a delicious, home-made pizza. 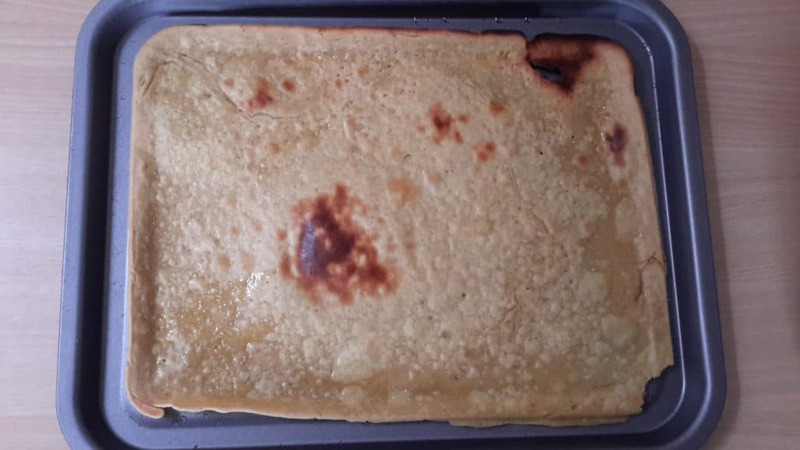 Squaring that circle sounded tricky, but then I came across Socca – a Mediterranean flatbread made from chickpea flour and water. 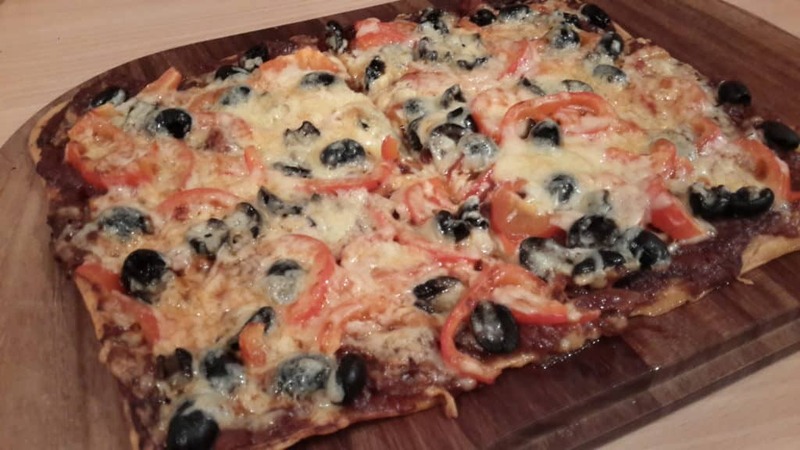 You can make it thin and crispy like crackers for cheese, make it a little thicker and use it like pitta bread or tortilla or… turn it into a pizza base. It’s easy to make, cooks quickly, tastes lovely and may just have saved my Friday night bacon. Figuratively speaking. It’s also gluten-free and Vegan. To make a batch of socca, you mix roughly equal quantities of chickpea flour and water, then add a splash of olive oil and a pinch or two of salt. For my big pizza tray, which very comfortably feeds two gluttons, I’ve used 150g chickpea flour, 200ml of water, 1/2 teaspoon salt and 1 tablespoon of olive oil. You can also add chopped garlic or herbs if you like. You cook your pizza base either like a pancake on the stovetop, or – as I did here – under the grill (broiler) in the oven. Oil your baking tray or skillet before you start. I think the trick is to get the baking tray or skillet really hot and the oil sizzling, almost as if you’re making Yorkshire Puddings. While the tray heats, mix up your batter, making sure it’s not lumpy. Then simply pour the batter into the hot oil, and watch your hands while you do it. It spits. 5-7 minutes under the grill got mine mostly done. Then I let it cool for a minute, flipped it over and gave the other side a little colour. I do like thin crust pizza, after all. If your pizza heaven leans more towards deep dish, use a little less water in the batter and don’t cook the other side. In either case, you can see that the crust shrinks while it bakes and comes away from the sides of the pan. It’s a good indicator to how close you are to ending up with burnt offerings. Once your base is done, let it cool a little while you get the oven hot. You can make the bases ahead of time, and they won’t spoil for a few hours. Top your pizza with a little or a lot of what you fancy, add cheese and bake in the oven until fragrant and bubbling. It’s still gluten-free, but mine is no longer Vegan at that point. Tonight’s pizza had tomato sauce, onions, peppers, olives and mushrooms, plus a layer of chilli-enhanced cheese. On other nights I might have pesto topped with green beans, asparagus and sliced courgette. Or I might just go for tomato sauce, roasted onions and my favourite pepperoni. Pizza heaven, right? Now with a low-carb alternative. Thanks Jackie. Looks interesting. As a diabetic and a food addict I’d love a pizza alternative. I’ll have to convert to American equivalents and give it a go. Gram flour is very fine, so I didn’t trust my cup measure. That’s why I suggested using roughly the same quantities of flour and water. That’s easy to measure and gets you a good start. It’s like pancake batter. How thick you make yours depends on how sturdy you like your pancakes.